San Francisco Ballet’s eightieth anniversary season continues with an absolutely delightful sixth program. For mixed performances, Artistic Director Helgi Tomasson tends to highlight the repertory breadth of his world-class company; often selecting three pieces from three very different genres or styles. With this set of works, he ventured outside this pattern, opting to pair one classical ballet with two very contemporary compositions. 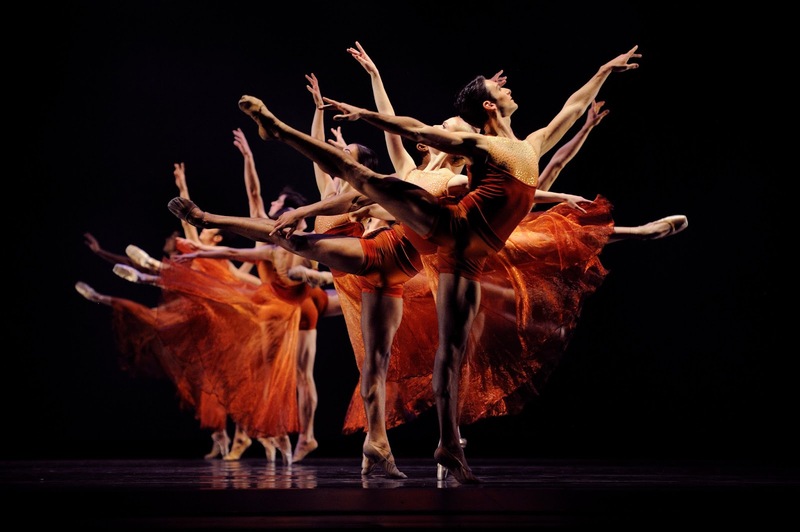 A little unconventional perhaps, but visually gorgeous and artistically compelling – exactly what one expects from an evening with the San Francisco Ballet. Opening the program was Act III of Rudolf Nureyev’s 1966 “Raymonda” (choreography after Marius Petipa). Combining character and classical technique, “Raymonda” is a smorgasbord of sensibilities: extravagant and whimsical; folksy and regal. The grand pas classique, with its clean lines and stunning unison, had moments of quiet simplicity as well as instances of extreme challenge - the latter exemplified as all sixteen dancers completed a single jeté entrelacé. Dancing the title role, Frances Chung’s boureés spoke volumes, revealing strength, determination, pride and command. In addition to the principal characters, four solos and two featured variations provided diversity and range to the work. Wanting Zhao (the first soloist) looked as though she was floating on air throughout a very difficult arabesque relevé sequence while Sarah Van Patten (soloist number three) combined a full back lay-out along with her developpé devant. I have to admit that I was a little torn about the men’s Pas de Quatre. Technically, it was fantastic; all four men quite brilliant, but something really distracted from this achievement. A couple of the guys just weren’t in character, which completely overshadowed their flawless technique. It goes to show that academic perfection can only take you so far. “Ibsen’s House”, Val Caniparoli’s examination into the famed playwright’s treatment of gender, was an artistic triumph. The ballet began by introducing us to five different female characters from Ibsen’s body of work, the distinct personalities and unique struggles being matched by Caniparoli’s creative movement. Well-communicated and interpreted by each dancer, Lorena Feijoo as Hedda Gabler showed passionate drama; Sofiane Sylve as Nora Helmer oozed desperation; Dana Genshaft’s Mrs. Alving was clearly trapped; Courtney Elizabeth was untamed as Ellida Wangel and Sasha DeSola gave a tortured portrayal of Rebecca West. Though the women’s roles were of course predominant, the partnering of each was imperative to the story, and thus was given the proper attention, choreographically and artistically. “Ibsen’s House” is a beautiful ballet, with its only downfall being that it does go a little long. Closing San Francisco Ballet’s sixth program was Edwaard Liang’s “Symphonic Dances”, another return appearance from last year’s season. With this 2012 ballet, Liang proves once again that he is a master of creating visual pictures through choreography and painting a living, breathing and evolving canvas before the audience’s eyes (think of the opening moments of his “Wunderland”). “Symphonic Dances” features three main pas de deuxs, the ending of each being one of these gorgeous, dramatic snapshot moments. And how Liang loves using second position (in plié, in relevé, in turns, in lifts); this wide stance was present here too, most notably in a recurring backwards sliding motif. The casting of Yuan Yuan Tan and Vito Mazzeo as the first pas de deux couple was the only puzzling element. Individually, both are fantastic dancers, but together, something is definitely missing. While nothing was wrong from a technical perspective, there was a definite lack of fervor, groundedness and passion in their pairing, which was especially apparent when the other two couples (Sofiane Sylve/Tiit Helimets; Maria Kochetkova/Vitor Luiz) danced their respective variations.